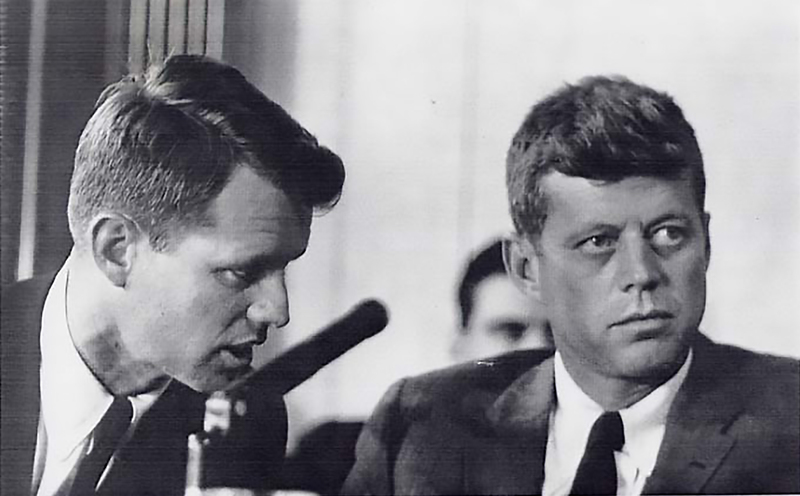 Just as with 9/11, the connections between the Kennedy assassinations and the Zionist labyrinthine network, are there for all to see. Isn't it time the world woke up to the criminal nature of this entity, rather than the Zionist-controlled-media-propagated fantasy? "Oswald’s assassin is known as Jack Ruby, but few people know that his real name was Jacob Leon Rubenstein, and that he was the son of Jewish Polish immigrants. Ruby was a member of the Jewish underworld. He was a friend of Los Angeles gangster Mickey Cohen, whom he had known and admired since 1946. Cohen was the successor of the famed Benjamin Siegelbaum, aka Bugsy Siegel, one of the bosses of Murder Incorporated. Cohen was infatuated with the Zionist cause, as he explained in his memoirs: “Now I got so engrossed with Israel that I actually pushed aside a lot of my activities and done nothing but what was involved with this Irgun war”. Mickey Cohen was in contact with Menachem Begin, the former Irgun chief, with whom he even “spent a lot of time,” according to Gary Wean, former detective sergeant for the Los Angeles Police Department. So there is a direct line connecting Jack Ruby, via Mickey Cohen, to the Israeli terrorist ring, and in particular to Menachem Begin, a specialist in false flag terror. We also know that Ruby phoned Al Gruber, a Mickey Cohen associate, just after Oswald’s arrest; no doubt he received then “an offer he couldn’t refuse,” as they say in the underworld. Ruby’s defense lawyer William Kunstler wrote in his memoirs that Ruby told him he had killed Oswald “for the Jews,” and Ruby’s rabbi Hillel Silverman received the same confession when visiting Ruby in jail. That is not all. At every levels of the conspiracy to kill Kennedy, we also find the fingerprints of the Israeli deep state. JFK’s trip to Dallas, being officially “non political,” was sponsored by a powerful business group known as the Dallas Citizens Council, dominated by Julius Schepps, “a wholesale liquor distributor, member of every synagogue in town, and de facto leader of the Jewish community,” as described by Bryan Edward Stone in The Chosen Folks: Jews on the Frontiers of Texas.Kennedy was on his way to the reception organized in his honor when he was shot." The “host committee” inviting Kennedy was chaired by another influential figure of the wealthy Jewish community in Dallas: advertising executive and PR man Sam Bloom. After the Dallas tragedy, Israel’s sayanim were also busy fabricating the official lie. Apart from its chairman Earl Warren, chosen for his figurative role as Chief Justice, all key people in the investigative Commission were either personal enemies of Kennedy—like Allen Dulles, the CIA director fired by Kennedy in 1961—or ardent Zionists. The man who played the key role in fabricating the government lie purveyed by the Warren Commission was Arlen Specter, the inventor of what came to be called the “magic bullet” theory: a single bullet supposed to have caused seven wounds to Kennedy and John Connally sitting before him in the limousine, and later found in pristine condition on a gurney in Parkland Memorial Hospital in Dallas. So, at all stages of the plot, we find a Zionist cabal including business men, politicians and Irgun-connected gangsters, not forgetting media executives, all devoted to Israel." The most plausible motive for Israel to kill Kennedy has been revealed by two books: Seymour Hersh’s The Samson Option in 1991, then Avner Cohen’s Israel and the Bomb in 1998, and the lead has been followed up in 2007 by Michael Karpin in The Bomb in the Basement. What these investigators reveal is that Kennedy, informed by the CIA in 1960 of the military aim pursued at the Dimona complex in the Negev desert, was firmly determined to force Israel to renounce it. With that purpose in mind, he replaced CIA Director Allen Dulles by John McCone, who had, as Eisenhower’s chairman of the Atomic Energy Commission (AEC), leaked to The New York Times the truth about Israel’s Dimona project; the story was printed on December 19, 1960, weeks before Kennedy was to take office. Then Kennedy urged Ben-Gurion to allow regular inspections of Dimona, first verbally in New York in 1961, and later through more and more insistent letters. The result was unexpected: Ben-Gurion avoided official reception of the letter by announcing his resignation on June 16. As soon as the new Prime Minister Levi Eshkol took office, Kennedy sent him a similar letter, dated July 5, 1963, to no avail. Did Ben-Gurion resign in order to deal with Kennedy from another level? Five months later, Kennedy’s death relieved Israel of all pressure (diplomatic or otherwise) to stop its nuclear program. Faced with Johnson’s complete lack of interest in that issue, John McCone resigned from the CIA in 1965, declaring: “When I cannot get the President to read my reports, then it’s time to go.” END QUOTE. "Israel panicking because they are losing Al Nusra and ISIS."